While the EMT contacted a physician over phone to take directions, the pride of lions, sensing human presence, emerged from the nearby bushes and surrounded the ambulance. Manguben Makwana will never forget the night of June 29. The 32-year-old delivered a baby in the vicinity of the Gir forest in an ambulance after midnight - but that was not all. 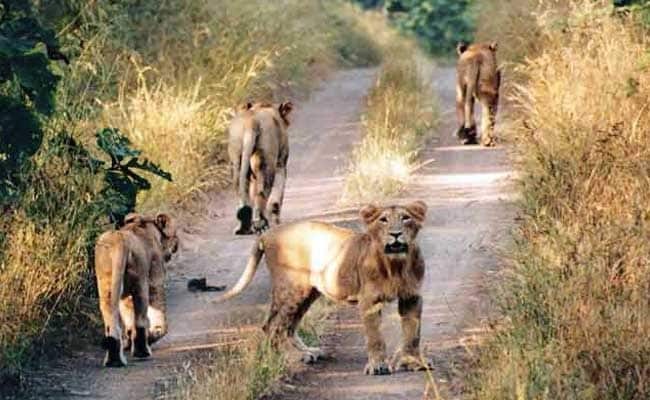 Even as she gave birth to a boy, a group of 12 lions emerged from the adjacent forests and surrounded the vehicle near a remote village in Amreli district. During this ordeal, which lasted for around 20 minutes, the paramedic staff of the '108' ambulance tackled the situation with courage and helped Makwana in giving birth, while the lion pride, including three males, blocked the vehicle's passage. The incident occurred at around 2:30 am on Thursday when the ambulance was shifting Makwana, a resident of Lunasapur village, to the government hospital in Jafarabad town, said Chetan Gaadhe, Emergency Management Executive of '108' in Amreli. "When the ambulance was on its way to Jafarabad with Makwana, the on-duty Emergency Management Technician (EMT) Ashok Makwana realised that she would give birth anytime, as the head of the baby was protruding out. Thus, he asked the driver Raju Jadav to stop the ambulance mid-way to deal with the emergency," said Mr Gaadhe. "Though Jadav, who is a local and understood the behaviour of lions, tried to scare them away, the lions refused to budge. Some of them even sat in front of the vehicle, blocking its passage," he said. Meanwhile, inside the vehicle, the calm EMT Ashok helped the woman deliver as per the directions given by the physician over phone while the driver Jadav monitored the movement of the "curious" lions, said Mr Gaadhe. "Later, Jadav started the ambulance and moved slowly so that lions would give way. Upon seeing the movement of the vehicle as well as the blinking of lights, the big cats eventually moved and gave way to the ambulance," he said. The mother and the child are currently admitted to Jafrabad hospital. Both are hale and hearty.The incident occurred at around 2:30 am on Thursday when the ambulance was shifting Makwana, a resident of Lunasapur village, to the government hospital in Jafarabad town, said Mr Chetan Gaadhe.